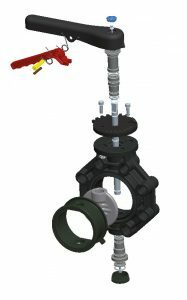 The new CEPEX EXTREME Series Butterfly valve is a fantastic option for flow isolation and regulation. With improved material availability, design, pressure and temperature; the new CEPEX EXTREME series range of valves offer fantastic products for use within industrial process and atmospheres. Designed for industrial applications in order to provide maximum accuracy and reliability to control the flow of your process, with excellent quality. The increased body and sealing materials offer combinations to suit a wide and varied range of processes within the Filtration, Chemical, Energy, Mining, Pharmaceuticals, Water Treatment and renewables industries. With the larger range of body materials available including PVC-U, PVC-C, PP-H, PVDF and ABS combined with EPDM and FPM O-Rings and liners offer excellent flow characteristics in a compact body across the range. As ever the process should determine the material selection according to chemical compatibility along with pressure and temperature considerations. With a large range of options for the operation of the valves including Handle with Multiposition Notch-plate and locking device, Gearbox and Options for electric and pneumatic actuation including all accessories such as pilot solenoids, switchboxes and positioners. CE Marked according to EN ISO 16138, each valve is laser marked with a serial and batch number allowing for 100% traceability. Each valve is also bench pressure tested with water as the medium at the factory in Spain which operates according to ISO9001 and ISO14001. You can be assured of the quality when buying an authentic CEPEX valve from Valves Online. 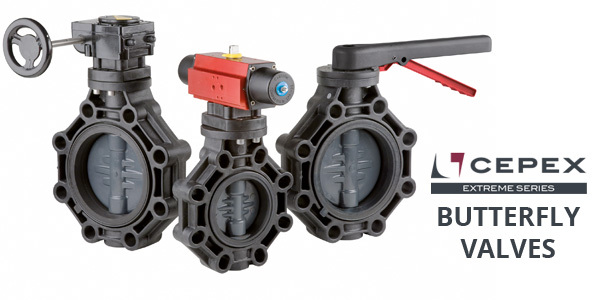 The full Cepex Extreme range is available to buy now - please contact us on 01822 855600 or email: sales@valvesonline.co.uk for more information and to discuss your valve requirements.